With interest rates rising across all treasury bonds, there comes a point where owning bonds becomes more attractive than owning stocks – where you’re willing to have a greater than 50% weighting in bonds in your portfolio. After all, treasury bonds offer a guaranteed return if held to maturity and they are state income tax free. Even with the 10-year bond yield rising to ~3.25% on October 10, 2018 from just 1.46% on July 1, 2016, is 3.25% a high enough risk-free rate for investors to make a shift mostly towards bonds? Probably not. In a research report written by Savita Subramanian, Head of US Equity & Quant Strategy at Bank of America Merrill Lynch, she believes the 10-year bond yield has to reach 4.5% – 5% before US equities start to look less appealing than bonds. I get why the bar charts would fall (lower stock allocation) after the 5% level. But it’s interesting to see how the stock allocation is lower when rates are between 1% – 4.5%. It’s also interesting to see how there was an uptick in stock allocation once the 10-year bond yield surpasses 9.5%. 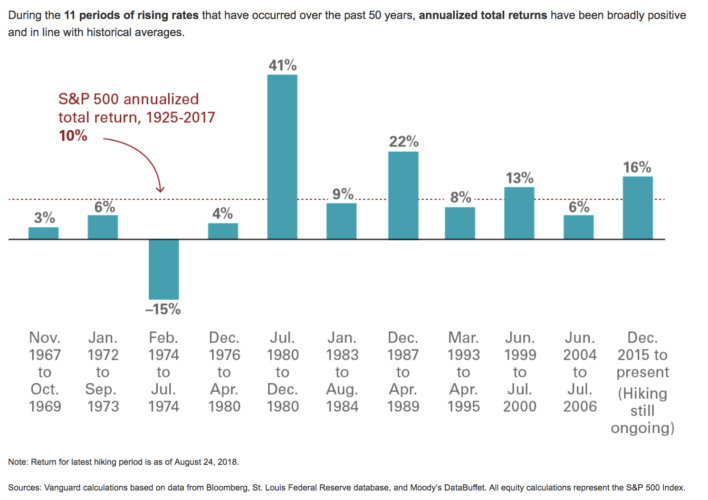 My guess is that at several points between 1985 – 2018, despite low risk-free rates, investors were simply too afraid to invest aggressively in the stock market because there was some type of financial catastrophe going on. In other words, investors preferred holding a bond that yielded just 1.5% versus potentially losing 10% – 50% of their money holding stocks. It has generally been OK to invest in stocks in a rising interest rate environment up to a point. A rising interest rate environment means there is inflationary pressure due to a tight labor market and strong corporate profits. Given corporate profits are the foundation for stock performance, a rising interest rate environment is an epiphenomenon. I’ve currently got about a 60/40, stocks/bonds asset allocation in my House Sale Fund with the 10-year bond yield at ~3.25%. 60/40 is interestingly slightly more aggressive than the BOAML chart would dictate at similar rates: 57/43. At a 3.5% 10-year bond yield, I would go 50/50. At 4%, I would go 40/60. At 4.5% I would go 30/70. And at 5%, I would go 20/80. I’ll stop at 5% since there is no way we’re getting above 5% again in my humble opinion. America is too smart and too efficient to allow inflation to runaway. We know that based on history, a 50/50 weighting has provided a healthy 8.3% compounded annual return. That’s pretty darn good if you ask me, even if the returns are slightly lower going forward. But remember, you’re not me. I’m more conservative than the average 41-year-old because both my wife and I are unemployed in expensive San Francisco with a son to take care of now. I cannot afford to lose a lot of money in our after-tax investments because I’m determined to stay unemployed until our boy goes to kindergarten in 2022. At a 4% 10-year bond yield, we’re now at the popularly espoused withdrawal rate where you will maximize your take and minimize your risk of running out of money in retirement. If you can earn 4% risk-free, that means you can withdraw 4% a year and never touch principal. Therefore, a 40% equities / 60% fixed income portfolio that has returned a historical 7.8% compound annual return since 1926 sounds quite reasonable. Eventually, higher rates will slow down borrowing and make borrowing more expensive. As a result, corporate profits and the stock market will decline, all else being equal. 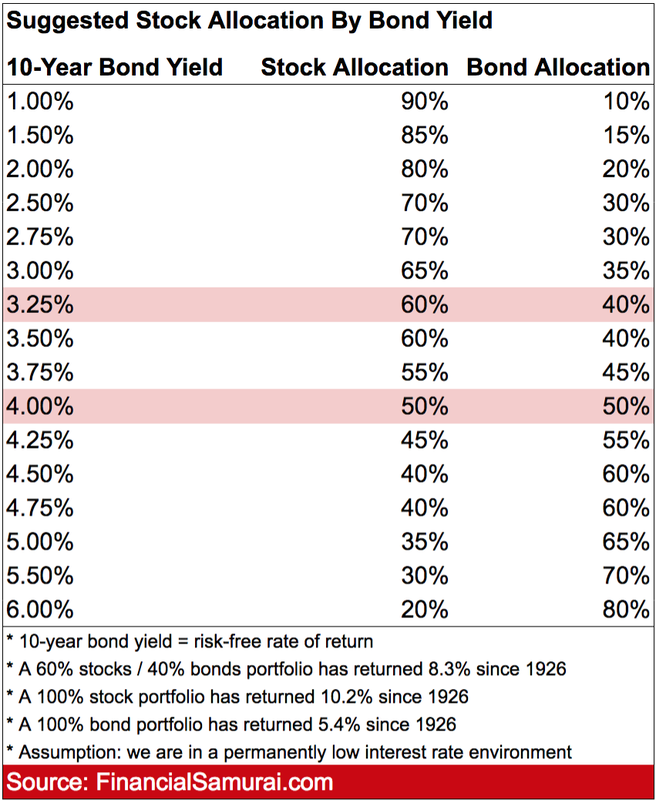 Based on historical Wall Street stock allocation data and the current economic environment we’re in, here is my suggested stock allocation by bond yield to consider for logical investors in a rising interest rate environment. Preferences will obviously vary, so use the chart as a gut check and make your own decision. The goal is to always balance risk and reward in what I believe will be a permanently low interest rate environment. The investor who tends to blow themselves up generally underestimates their true risk tolerance. Bank of America Merrill Lynch believes we shouldn’t worry until the 10-year bond yield hits 5%. I say you absolutely should worry about your stock investments if the 10-year bond yield hits 3.5% – 4%. I assign a 40% chance of the 10-year bond yield reaching 3.5% within the next 12 months, and a 25% chance the 10-year bond yield will hit 4%. If the 10-year bond yield hits 3.5%, I expect up to a 10% sell-off in stocks, and up to a 20% sell-off in stocks at 4%. The more likely scenario is that the 10-year bond yield stays at 3.25% or less, and the yield curve resumes its flattening as the Fed raises rates further. In such a scenario, stocks are also capped as a recession usually ensues within 18 months after the yield curve goes flat or inverts. At a 4% risk-free rate, a 30-year fixed mortgage rate will be at around 6%, choking off the housing sector. In such a scenario, I don’t see much incentive to take more risk in stocks or real estate anymore. I’m confident the vast majority of you have seen your net worths double or more since the financial crisis. As a result, the return on your larger net worth no longer needs to be as great to return the same amount of income or principal appreciation. I was aiming for a 4% – 5% rate of return on my after-tax investment portfolio when I left my day job in 2012. With a larger net worth today due to some fortuitous investments and hustle, all I need is a 1% annual return to match the absolute dollar amount I desired in 2012. But by the power of Greyskull, I can now get a 3.25% risk-free return so I’m pumped! All of you should go through the exercise of figuring out your asset allocation at different 10-year bond yield levels. 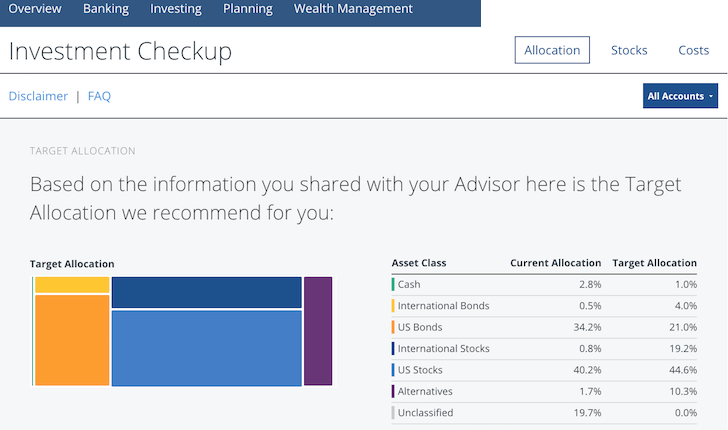 I highly recommend you run your investments through an Investment Checkup tool to see what your current asset allocation looks like compared to what you want. Asset allocations can shift dramatically over time. Good investing is all about understanding different scenarios and managing your risk. With interest rates rising and such a huge run up in stocks and real estate, it’s only logical to dial down risk and enjoy life more. At what bond yield would you reduce your stock allocation to 50% or less? Readers, at what 10-year bond yield are you willing to shift to greater than a 50% weighting in fixed income? Where do you see the 10-year bond yield going from here? Anything interesting you notice from the BOAML chart? I bookmarked this post because I expect to lean back on this information as the rates change. I have started to do that more often with your posts. The reason is simple, the advice is clear and makes sense. It also saves me the time in doing the math for a lot of these. The trick for me is doing the periodic assessments of my risk tolerance, and adjusting my portfolio when that changes due to my evaluation of the economic indicators. What are your thoughts in keeping your bond allocation in a money market yielding 2.2% instead? That way you don’t lose principal when interest rates rise. Or is there something else I am missing here? I’ve always been surprised by such a high bond allocation. If your business is generating enough income to cover your expenses, wouldn’t your investment timeline theoretically be forever? Or at least until you sold your business or it declined. I run an Internet business and have about 80% of my investments in stocks, 15% in real estate, and 5% in high interest savings accounts. My business produces way more than I need to live on. But even if that wasn’t the case, my passive investments also produce enough income. That makes my investment timeline very long so I wouldn’t have to sell in a crash. Couldn’t the same be said for retirees with social security and government pensions that cover their expenses? My parents have both so they will probably never need their investment money, unless they decide to splurge. It depends on how much you had and how much you lost during the 2000 and 2008 downturns? How did you do? Eventually you want to use your money for something. Otherwise, there’s no point in investing and saving all these years. I lost a lot during the market downturns, but since my time horizon is so long, I didn’t sell. In fact, I bought a lot more. It would be a different story if I needed the money within a few years. At current Yield level, things start to get interesting. 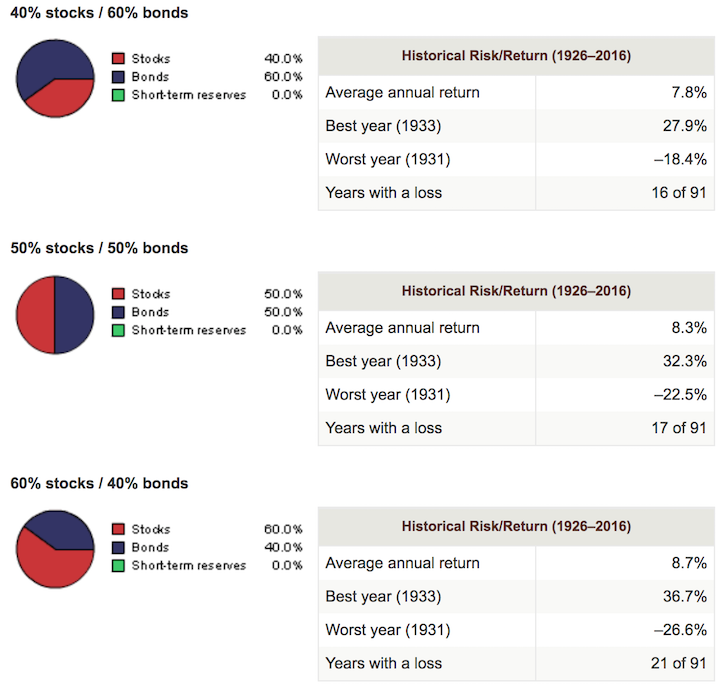 People can build reasonable portfolios based on their preferences and risk tolerance. Your suggestion presents a good starting point. Thanks for sharing! Here in Switzerland, we have a much worse situation. Yields are still very low, even negative… so… there is not much one can do to build a reasonable portfolio. To make things worse, the SMI itself is not really diversified (a few companies hold half the allocation). Thanks- super helpful. 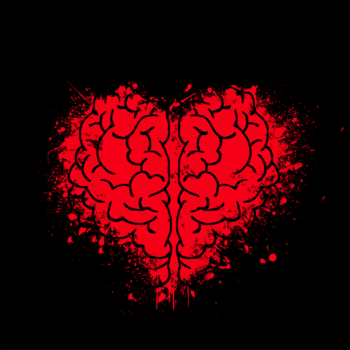 AND… although I am positioning myself with an after-tax account that could sustain early retirement, I know that my wife will work for a lot longer than me and likely into her 50s. AND, thankfully, we can support our lifestyle with only her income. Therefore, does it still make sense to structure my after-tax account as you mention in the short term, or can I leave it in a much more aggressive stock-focused portfolio for maximum long-term returns knowing it likely won’t be touched. If it helps, I am 39. Thank you. One of the keys to early retirement is to get your spouse to work longer so you can be free. Check out: How to make your spouse work longer so you can retire earlier. Some great tactics are in there from spouses I’ve spoken to. You can be slightly more aggressive, but not so much so, especially since you plan to retire early. I’m a huge fan. I have scoured the site and can’t find what funds you hold your pre and post bond allocations? Can you please update me with your suggestions in 2018? Hi George, b/c I’m based on California, I’ve bought individual California muni bonds, and the California muni bond ETF, CMF. There’s MUB for the national muni bond fund. When I go to Hawaii, I’ll be looking to support Hawaii with Hawaii muni bond funds. Okay, I did read that. Sorry to waste your time. I should have been more specific with my question: I live in VA- for those of us that don’t have muni state ETF (don’t know if any VA muni ETF) what would you do? A lot of blogggers recommendation the Vanguard total bond funds for the bond allocation. What is the easiest way to get into 3.25 bonds without using the treasury direct account? any good etfs? Even when the 10-year bond yield was at only 1.5%? Kinda tough to make money in that scenario. How old are you? I think it depends on your time horizon. It also depends on how you want to adjust your portfolios of taxable/retirement accounts. I sense this bull market is somewhat similar to the one of late 1990s. We have high flier new-tech stocks in artificial intelligence (AI), cloud computing and Internet of Things – these companies carry P/E multiple north of 200. Likewise, in late nineties, we had internet stocks with P/E north of 100. Since trees will not growing into sky forever, when music stops say 2020, we may experience a bear market that lasts very long. Mindful that we lost a decade of no-return of S&P from 2000 to 2010, I am not sure the long term projection of 7% return might not be applicable for the next 10 years. For me, since I do not plan to touch retirement accounts for at least 12 -15 years, I am comfortable to keep 70/30 to ride out the potential “lost decade.” But I will definitely reduce stock holdings in my after-tax account when treasury rate hits 5%. I might have 40/60 allocation (40 into mostly growth/dividend stocks, 60 into muni and treasury). BTW, treasury rate hit 5% in 2007. And we know what happened afterwards. Retirees will LOVE a 5% 10-year bond yield. I know I would! Know that my investments are earning a guaranteed 5% every year would be amazing. I’d just focus on generating active income for a fun supplement. Too bad we ain’t going back to 5% ever again IMO. Why not use the tax advantaged space for bonds? Maybe you have said why in the past, not enough room? Bonds are important if volatility is a big worry and you are banking on that income. Seems to me that you have the ability to take more risk but no need…good for you! Sam, what do you consider the most helpful texts on learning more advanced philosophies and tactics regarding investing? I apologize if you have already written a post on this. Thank you for the insights and for stimulating a lot of thought! Loved this article- thanks for writing. You’ve always had a spot for bonds, Sam. I haven’t the same, Although I live in Australia with a slightly different financial market and tax structures. I hold paying down debt is similar to investing in bonds, and hold your FSDAIR (think that’s what it was called) with high regard. In your view could this strategy be used as an alternative in a rising rate environment? Hi Mo – FS-DAIR is for investing or paying down debt, and this strategy is 100% on investing. So you can take this strategy for the investing portion of FS-DAIR if you wish. I think you should always follow FS-DAIR if you have debt to pay down, no matter what. I skipped other comments because I don’t have much time but answered 5%. I need 4% and I could live off of that but need some sort of hedge against further inflation. 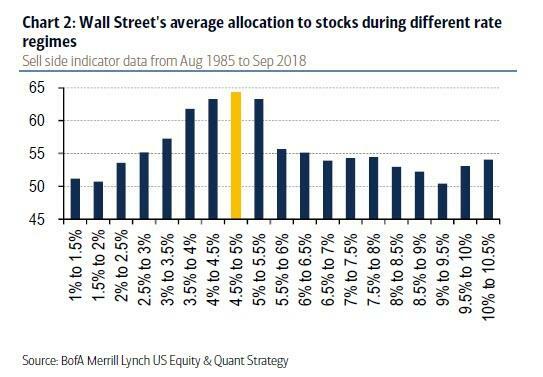 I agree with lower for longer and I think if we hit 5% it will be so brief that it’ll be an almost “all in moment” where it’ll decimate the stock market and follow with a recession. Rates will drop and you could ride it out with a small buffer incase you’re a bit off on timing. I’m waiting, hoping, praying for the fed to overshoot and they seem to be doing a bang up job of it. I’m a fan if bonds now bht didn’t have any bond exposure at all in my 20s. I started slow into bonds in my early 30s and have worked up to a rough 60/40 stock/bond ratio across most of my accounts. I try to keep it roughly 60/40 to 55/45 for the most part. Not sure when I’d go 50/50, perhaps in one or two accounts if rates went above 4.5%. Sam, what is the exact instrument you are buying to protect against future rate hikes while taking advantage of the current environment while also avoiding CA taxes? I looked at various options but couldn’t land on one. I know Mr. Buffett says to ride out a recession and be patient. But as you stated, “net worths double or more since the financial crisis”, it’s so tempting to move most of your assets into bonds for locking in gains and letting a recession take its course. How do we decide when that shift in mindset from accumulation to preservation should begin? Could it be that we are somewhere in the middle and what does that sub-group do? > I’ll stop at 5% since there is no way we’re getting above 5% again in my humble opinion. America is too smart and too efficient to allow inflation to runaway. I think it’s a possibility: If the U.S. has to sell a lot of U.S. Treasuries over the coming years (mainly to fund its retirement and health care obligations), foreign investors may push the 10-year yield above 5%. It may not be inflation, but supply and demand of U.S. dollars, that does the trick. How would you adjust this if you were in your early-to-mid 20s, with a 30 year retirement horizon. At current rates, even 20% feels like too much for me. But I’ve never lived through a serious downturn (opened my portfolios in 2014), so I might just be over optimistic here. TBH I’ve never looked at bond rates to determine my allocations. Perhaps when I’m closer to FI and working on a decumulation strategy I’ll pay more attention. It seems more relevant at that time. Can you explain how you invest in bonds? It sounds like you are purchasing directly, because bond funds can lose money in a rising interest rate environment due to duration risk. As an early retiree and a “stocks for the long run” investor, bonds are an area I want to get into but I’m not sure how. I would agree. Bonds to me are a bit confusing. A basic lesson in bonds and how to buy bonds would be great Sam! Another vote for this. Are these bond funds or are you picking specific ones through a brokerage? I was somewhat surprised to see that most votes were to keep money in the stock market regardless of how high the bond yield goes, even though this is how I voted. My reason is that my retirement will not be dependent on the money invested in stocks since I’ll have a pension and rental income so I’m not worried if there should be a recession by the time I want to retire. I have the luxury of holding out until the market rebounds to cash out stocks. Since the S&P has been returning 10% over the long term the gains are much greater to keep invested with stocks. I tend to lean toward alternative investments like REITs and MLPs for my income investing. Both categories tend to provide more income than bonds currently do. In the case of MLPs there are also tax advantages that I find very attractive. Outside of the tiny allocations in my index funds, I actually don’t own any bonds directly. The volatility of stocks have never bothered me enough to reduced the percentages that I hold in them. I hold approximately 15% of my portfolio in REITS, 10% in MLPs and the remaining 75% in more traditional equities and index funds. It’s always interesting to read about different investing methods being employed. Honestly it has no impact on my stock allocation for one specific reason. Once the bonds adjust its already too late to sell stocks. The impact of the bond price is already in stocks. Hi, any suggestions on the best ways to go about purchasing Treasury bonds? I use Vanguard for my mutual fund, Fideltiy for 401(k), Betterment for Roth IRA, & Ally Savings for e-fund & extra cash. Can you combine with any of those spots? Or you have to go through TreasuryDirect? Thanks — love the blog! Don’t use a mutual bond fund. If fellow investors get the willies the fund might have to sell bonds at a discount and the NAV will suffer even more. Just use Treasury Direct and stay on the short end. Also build a physical gold allocation for the eventual sovereign defaults that will likely manifest as devaluations of debt against gold. Anytime someone tells you to hold physical gold, you can toss out their investment recommendations. Gee, then why have central banks been stepping up gold purchases and trimming back USTs? What do they see coming? It will be a binary event. Just like 1933. When we last had sovereign defaults. Their is some merit in an asset allocation featuring ‘alternatives’ like gold, RE, PE, art, etc. You can buy treasuries at the auction through Fidelity and the other major discount brokers with no commission. At Fidelity, under the Investment Products tab, click on Fixed Income, then Individual Bonds, then U.S. Treasury. Then click on Find Bonds. You will see a small tab for Auction under U.S. Treasury. Click on that. Auctions are Monday and Tuesday. Four week bills are auctioned on Tuesdays, longer duration on Mondays. Anticipated yields are posted Friday and Monday. As of today, Friday, October 12, the anticipated annual yield on 13 week treasury bills is 2.24 percent. 26 week bills are anticipated to yield 2.42 percent. Interest on treasuries is exempt from state and local taxation, unlike interest on a savings account or CD. Do you have to invest a minimum of $10000 to buy those notes? For Fixed Income – this is where managed funds work very well. Dollar for dollar, trading bonds is much more expensive than trading stock. Lack of exchanges, basic electronic trading and a lot of the market still being traded over voice (for sizeable trades) are key deterrents. Outside of government bonds, and particular for corporate bonds/credit using a fund manager makes a lot of sense. New issue bonds (which occurs much more frequently than IPOs for stocks due to fixed vs indefinite maturities) generally carry new issue premiums, and these bonds are allocated almost exclusively to professional/non-retail investors. This makes it easy for bond funds to outperform the index, and outperform an individual trying to build the same portfolio. For US treasuries – best way to buy them is direct. However, there aren’t many cases where it really makes more sense to buy treasuries than invest in a high yielding bank CD- particularly as banks are much more sound now than 10 years ago. Good article Sam. Would be interested to know how/if adding another variable, namely expected years to retirement, might change your analysis? Sure, it’s definitely logical to be more conservative in retirement or when you’re close to retirement, say within the next 3 to 5 years. Maybe lower the stock waiting down by 5 to 10% as well. But I’m on employed right now, and have been for the past six years, and I’m comfortable following this guide. Interesting thoughts on your allocations between stocks and bonds stratified by the 10-year Treasury rate. I see your logic and agree with switching more to bonds as interest rates rise because this locks in a guaranteed return virtually risk-free. I think your spectrum is slightly simplified given it doesn’t mention the effects of inflation besides confidence in America preventing it. However, I think it’s a nifty guide for thinking about investment allocations. Your conservative allocation makes sense given your lifestyle situation and why you prize lower returns for much lower risk. I can dig that. For my retirement holdings, I’m currently close to 90% equities and 10% debt or alternative investments (LendingClub notes). For those accounts, I want long-term price appreciation and still think stocks offer that in the current environment. However, as interest rates move up, I may consider switching more of those funds into debt to lock in more guaranteed returns and also setting up for the inevitable recession and reduction of rates by the Fed. I’m also moving my after-tax accounts more toward debt in the coming months in anticipation of buying a house in the coming couple of years. Overall, I think you’re logic is sound. Thanks for sharing. And one nit – being an economist, I should say your use of the word “unemployed” isn’t accurate. Unemployed implies you are out of work but currently looking for employment. I don’t believe that to be your case as you are out of the labor force and not looking. It would be correct to say “retired”, “out of the labor force” or “self-employed” since you have a small business (Financial Samurai). It’s not risk free. These things bond pay you back with are central bank liabilities. They will devalue those liabilities to save themselves at all costs. 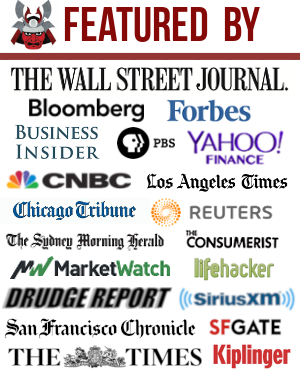 I was going to mention Lending Club as well. I find diversified p2p lending to be an excellent asset class sitting between the bond/stock risk/reward curve. It’s not very tax efficient though at basically ordinary income the whole time. Even in a doubling of expected loss ratios, you are still sitting at about the bond yield rate. I agree about Lending Club and the tax efficiency. I held a large percentage of my portfolio with them in an after-tax account when their original CEO was forced out. Many note investors thought the company would go under and the notes platform would go bust. What many didn’t realize in the case of Lending Club going bankrupt, however, is the platform would transfer to a third-party to manage. The solvency of Lending Club had no bearing on the existing notes, only on new ones being issued. Seeing a large number of notes investors wanting to sell their notes at extreme discounts, I chose to ease their burden and take them off their hands. The alpha from those notes have provided me roughly 5% of excess returns in the two years since above what my primary market notes returned me. I’ve let those notes mature in my after-tax account and still fund notes in my Roth IRA account where I don’t suffer from a tax hit. I think the service has a great diversification effect and is a great passive income vehicle for after-tax accounts. It also adds fixed-income exposure to your portfolio. I’m definitely unemployed and proud to be a stay at home dad. There’s nothing more important to me right now. But I have looked for jobs online and I have never received a response. I’m preparing to work a vacation job once my boy turns two years old. Be mindful once you buy a long term bond in this environment you are married to it until maturation. Bonds with duration risk lose market value on principal as rates rise. Plus there is another risk…currency risk. At some point all indebted countries will hold hands together and devalue en masse against gold. So even if you getting 5% on a UST you’ll be getting paid back in devalued currency. Deflating a strong dollar could actually help corporate profits. Further most Americans don’t have a passport and don’t even speak a second language. Therefore, even if the US dollar to values, it’s all the same since most people just stay in America. It’s all about buying locally produced goods anyway. Go USA! Maybe I’m missing something, but isn’t looking at bond yields without looking inflation kind of pointless? In your example, if the inflation is at 2%, you can only withdraw 2% a year. Yep, it’s because bond yields take into account inflation. Bond yields are an epiphenomenon and almost always have a real interest rate. Would it help if I write a primer on how bond yields move? Yes- totally understand that bond yields take inflation into account. And that there’s a correlation between bond yields and stock market/real estate market performance. But I think that was the point of the question– a 4% bond yield might not be any better than 1-2% yield of several years ago when you subtract out inflation. In your article, it sounds like you are excited about moving into bonds because of the higher nominal yield they offer now, thus the confusion (since both scenarios probably offered roughly the same 1% real return rate). Sounds like you may have meant that higher yields are signal that diversifying out of stocks/ real estate is a good idea? Inflation affects the real return on dividend yields in stock as well. Everything is baked in, Although you can make a forecast on where you think inflation will go, and invest in bonds or stocks accordingly. How do bond yields take inflation into account? The current yield 10-year treasury yield is around 2.8%. Assuming a 2.2% rate of inflation, this translates to a real yield of 0.6%, right? Correct, a real return for the present year at least. Yields and inflation will change over subsequent years. But a nominal return of 2.8% is a nominal return. Much better than a -6.4% nominal return in the S&P 500 in 2018. Great table Sam, thx. I like it. Im a 55/45 split. Totally agree that you must take risk off the table as rates rise, and primary goal is the protect your portfolio. You ever think about buying SPY puts as insurance against a downturn? I know some folks that have done this and they are looking pretty smart right now. I have, but I haven’t. I’ve been too busy focused on generating active income online or shifting risk assets to low risk or building cash. 5% is my magic number. I’d go with 50/50 at that point. We’ll probably become more conservative as we age, though. By the time the interest rate reaches 5%, I might be conservative enough to put a lot more weight in bond. For now, I’m okay with 75/25. Great job with your investment. 1% annual return is a very easy target to hit. I noticed you specifically referred to your after tax investment a couple times for this article. Would this same bond/stock ratio logic apply to pre-tax retirement holdings as well? It should be relatively consistent across pre and post tax investments if the withdrawal time is the same. But usually, you can afford to be more aggressive with your pretax investments if you are investing past the age of 60. So perhaps you can increase the stock allocation by 5% -10% at each bond yield. It’s really up to you and your risk tolerance and objectives.